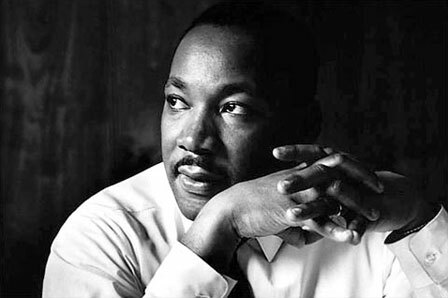 The Resilient Leader: What do you think, Dr. King? What do you think, Dr. King? Today we celebrate the life and work of Martin Luther King, Jr. He had a dream. Did his dream come true? He would have been happy and proud to see an African-American president enter the White House in 2009. I am sure he would be pleased with many other changes that have occurred throughout the US since the civil rights struggles of the 60s. I suspect he also would be impatient with some of the things that haven't changed, or not changed fast enough, such as: the level of diversity within executive leadership ranks in government and business; differential poverty rates among people according to race and ethnicity; the high percentage of young African-American males who populate our prisons; the lack of educational attainment by so many of our children. Racism continues to rear its ugly head. It does not go gentle into that good night. If we are honest with ourselves, we recognize that we all contain seeds of racism; and we certainly witness racism and bigotry throughout the world, where violence, repression and hatred is directed at one's race, religion, gender, sexual orientation, ethnicity or other factors that render one "different". We have come a long way, but we have a long way to go. As leaders, we are models. For change to occur, we must start by being honest with ourselves about who we are and what we value. Dr. King did not give up.......let's keep his dream alive. Yes, yes, I couldn't agree more as I share the following piece I pondered on. It’s that time again. Candidates and their supporters are gearing up for another election and I continue to be confused. If we are truly convinced as Dr.King was that Jesus’ primary message was one of justice where He preached love, forgiveness, peace, kindness, hope, and grace then how do we as Christians endorse or even contribute to the malicious actions of our politicians who are suppose to be our representatives? We likely are in the midst of one of the most expensive and mean-spirited political campaigns in the history of our country. I thought we were in the worst economic times in our history. How can we say we are unable to afford health care and education when millions of dollars are spent on campaigns while at the same time, people are homeless and starving and cannot afford to take care of basic health needs? Throughout all of this, candidates from all of the parties invest millions of dollars on demeaning ads that are designed to show that they are more righteous than their opponent. There’s something wrong with this picture. How can one be so righteous while at the same time be so willing to sling mud at another person? Somewhere the message has been missed from Ephesians that says, “Let no evil talk come out of your mouths, but only what is useful for building up, as there is need to, so that your words may give grace to those who hear.” Whoa! I don’t hear any adherence to those words in the campaign ads. Many of us profess to live by Christian values but if so, do we not believe these words that Peter said in Acts? “I now realize how true it is that God does not show favoritism but accepts men from every nation who fear Him and do what is right.” I’m feeling pretty fortunate about this because I’m pretty sure I don’t fit into some of the categories that my political representatives feel are most worthy. Would we not gain far more as individuals and as communities if we took some of this knowledge from scripture and applied it to our own daily lives? I know I could certainly benefit. Breaking the habits we have formed for so long is hard work and may not be possible to accomplish in a lifetime, but we are not asked to be perfect. That won’t happen. However, we know of many who have taken the spirit of love that Jesus taught and have made amazing contributions in places where they felt they could make a positive difference. What we are asked is to take that same spirit of love and do the same.